My sweet chickies have been cooped up for so long because of the weather, and I felt so guilty. When we finally have a break in the rain, and I sent them free on the yard, they spend it inside another house. 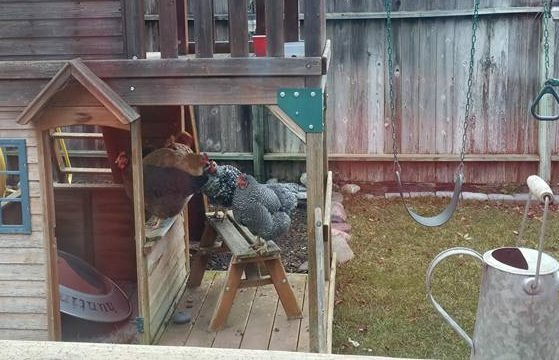 You should have heard the mean clucks they gave me when I wouldn’t let them out before, and then they do this! In BEFORE HE SEES (A Mackenzie White Mystery — Book 2), FBI agent-in-training Mackenzie White struggles to make her mark in the FBI Academy in Quantico, trying to prove herself as a woman and as a transplant from Nebraska. Hoping she has what it takes to become an FBI agent and leave her life in the Midwest behind for good, Mackenzie just wants to keep a low profile and impress her superiors. But all that changes when the body of a woman is found in a garbage dump. The murder bears shocking similarities to the Scarecrow Killer — the case that made Mackenzie famous in Nebraska — and in the frantic race against time to stop a new serial killer, the FBI decides to break protocol and give Mackenzie a chance on the case. It is Mackenzie’s big break, her chance to impress the FBI — but the stakes have never been higher. Not everyone wants her on the case, and everything she touches seems to go wrong. As the pressure mounts and the killer strikes again, Mackenzie finds herself as a lone voice in a sea of experienced agents, and she soon realizes she is in way over heard. Her entire future with the FBI is in jeopardy. As tough and determined as Mackenzie is, as brilliant as she is in hunting down killers, this new case proves an impossible riddle, something just beyond her reach. She may not even have time to crack it as her own life falls apart around her. On the surface, Valerie Dobson has the perfect life. She’s the star of a popular network drama. She has a loving boyfriend of eight years. Everything she touches turns to gold. But underneath her beautiful exterior, lies a beautiful soul with secrets. Jesse Savoy has been in love with his lovely co-star since the day they met, and if not for her boyfriend, he’d have begged her to marry him years before. As soon as her relationship fizzles, he drags her off to Vegas for the marriage he desperately wants. Will her fears of intimacy keep her from having the marriage they want? Or will they be able to overcome them together? When I turned 30 without getting my first kiss — yes, you read that right. Read over it again if you need to. Anyway, when I turned 30, I decided I had to take action and get a first kiss to be remembered. So I devised a method to get my first kiss in a way that would be guaranteed to make it meaningful: I would auction off my first kiss for charity. In this quirky memoir, I share details from my life, exploring exactly how it was that I came to a kissless crossroads at age 30, and I tell all about the exciting and challenging experiences I faced as I developed the Kiss Chronicles project. Five years ago, The Absolute Top Chefs of America Culinary Institute was given a challenge, a really big challenge! Create the absolutely most delicious, delectable, heavenly, luscious, mouthwateringly, scrumptious, succulent, tasty and yummy Pie Recipes ever! A pie that, upon first bite, there’s a, “Wow, this is the absolute best pie I ever tasted! I gotta have the recipe!” The Absolute Best Pie Recipes Cookbook is a result of that challenge. If you’re a bona fide foodie who demands only the best of the best recipes using the best of the best ingredients, this cookbook is a must have for your cookbook collection! The Absolute Best Pie Recipes Cookbook guarantees each recipe will be absolutely delicious, delectable, mouthwatering and totally scrumptious!